Rate this Article The awesome visual effects of 3D virtual reality are such that you can actually perceive things like they are real, however when you instinctively reach out with your hand, there’s nothing there. This is where GloveOne comes in! The awesome visual effects of 3D virtual reality are such that you can actually perceive things in front and within reach of you. You instinctively reach out with your hand but there’s nothing there. Unfortunately, the VR headset you’re wearing just doesn’t include tactile feedback. VR or Data Gloves have been in development for some time with uses in scientific and industrial applications but mostly as a control device, a way to reach out into Virtual Reality with your hands. 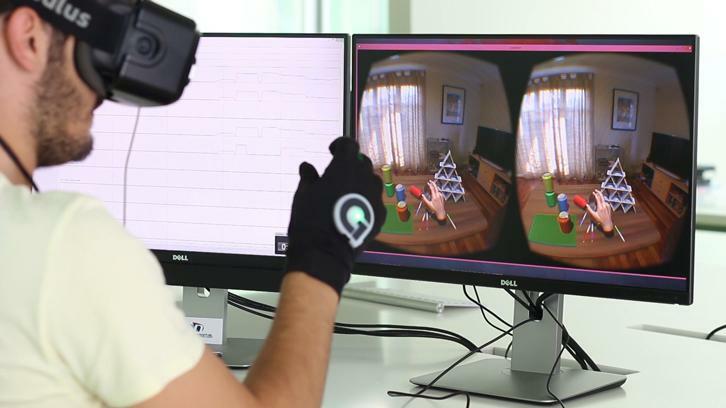 Spain based company NeuroDigital Technologies aims to give VR users a more complete experience by developing a data glove that will enable them to feel what they see. Enter GloveOne, a data glove smart controller that relays Haptic or Tactile feedback to the user giving the sensation of touch. Each glove has a set of 10 vibrotactile actuators (5 for the finger tips and 5 for the palm) which individually vibrate at varied frequencies and intensities thus giving the sensation of touch as accurately as possible. It’s like when your game controller vibrates but in a much more smooth and fluid way. Aside from the actuators, GloveOne uses 6 IMU’s (inertial measurement unit sensor) for precision motion tracking as well as a 9 axis IMU for hand tracking. These sensors have the ability to sense each other and communicate data which are used to output feedback information through the actuators. This simulates the feel effect for the virtual objects held or touched by the user. A rock, a fruit or a butterfly fluttering its wings can now be felt. It can even transmit heat brought about by touching a virtual fire or the sensation of cold rain pelting down your hand. GloveOne also uses a conductive fabric that allows users to make gestures, interact with objects like buttons, and trigger actions and commands in a reliable way. A long life Li-Po (Lithium-Ion Polymer) battery pouch that gets charged when the glove is connected via USB is located at the wrist section. This set-up insures that you can play for long periods of time without having to worry about your glove power running low. The installation and user guides (available on-line) are quite concise and easy to follow. Just make sure your pc has a USB2.0 (or higher) port and an optional Bluetooth 2.1 (or higher) adapter. Unfortunately at the moment, the device is only fully compatible with Windows 8.1 so using it with another version of Windows may not work at all. However you have 2 options when it comes to connecting the device to your pc. You can use a USB cable or the Bluetooth adapter. If you opt to use USB, you will need to connect the glove to the port directly. Making use of extension cables or hubs may hinder the operation of the device or render it inoperable. Using the Bluetooth will need the process of pairing the device with the computer. You can find the complete instructions in the user guide. Also, you will have to download and install the GloveOne Manager. The manager installer contains all the needed libraries, drivers and executables needed to provide communication between GloveOne and the computer. Once installed, using GloveOne for the first time will run a windows service called GloveoneSvc which will assign TCP socket port 5905 to GloveOne allowing applications for the glove to use it. You will also be required to clear the port through your Firewall to prevent it from hampering the data glove’s operation. This is something many MMO host servers do in order to connect the game client in your pc to the server. The GloveOne Manager app does just that. It manages all the glove’s devices connected to your pc. You can also view the glove’s system status, get IMU sensor values and perform tests. A debugging graph tab shows all actuator power values in real time. The battery’s power level is shown in the manager as well. At present, GloveOne works with tracking systems like Intel Realsense, Leap Motion, X-box Kinect and even a regular web cam. In fact, the data glove can be used even without these devices providing the app doesn’t require knowing the position of the hands to provide tactile feedback. Software development wise, the GloveOne SDK is currently provided only with a plain C++ dll and a C# wrapper. The only game engine supported so far is Unity as a dll for it as well as support packages to ease integration with Leap Motion and Intel Realsense is provided. According to NeuroDigital, Unreal will be the next game engine to be supported. With more game engines supporting the device, you’ll be able to play more games using GloveOne. GloveOne has been successfully funded via Kickstarter, a popular crowd-funding platform. With the data glove prototypes ready and working, the company is currently in the process of mass producing it commercially and making it available to the public. At present, no announcements have been made regarding the unit price or the final shipment date. However, the company has been keeping their anticipating audience abreast of any updates.